J. R. R. Tolkien in 1972, in his study at Merton Street. John Ronald Reuel Tolkien (3 January 1892 Bloemfontein, Orange Free State – 2 September 1973) was an English writer, philologist and university professor, best known as the author of several influential fantasy books such as The Hobbit and The Lord of the Rings. He also worked on translating the Bible, particularly the Book of Jonah for the Jerusalem Bible. He had a lifelong interest in and love of language, and also created several constructed languages. Tolkien also created the Middle-earth legendarium, a fantasy world with a detailed geography, history, and inhabited by Men, Elves, Dwarves, and Hobbits. Tolkien was a Roman Catholic. Tolkien was born in Bloemfontein, South Africa, to British parents, Arthur Reuel Tolkien and the former Miss Mabel Suffield. At the age of three he returned to England with his mother and younger brother, Hilary Arthur Reuel. His father died in Africa before he could rejoin them. Tolkien spent his early childhood in Sarehole, a Worcestershire village, which later influenced him in the creation of the Shire. Now living in Birmingham, Mabel Tolkien and her children were received into the Roman Catholic Church in 1900. This enraged staunch Protestants on both sides of the family and Mabel Tolkien subsequently left without any financial support. She died in 1904 of diabetes, leaving her sons in the care of Father Francis Morgan, a priest of the Oratorian Order. Tolkien grew up in the industrialized Edgbaston district of Birmingham and attended King Edward's School. The polluted sprawl of Birmingham is believed to have influenced his creation of Mordor. In 1916 Tolkien married Edith Mary Bratt, with whom he had four children: John, Michael, Christopher (who served with the RAF in Africa during WWII), and Priscilla. In October of the same year he was sent to the Western Front to serve as a signals officer at the Battle of the Somme. After coming down with trench fever, he was invalided home and spent the remainder of the war as an emaciated patient in various military hospitals. His affliction was almost certainly caused by the flea bites suffered in captured German trenches at Thiepval Ridge. 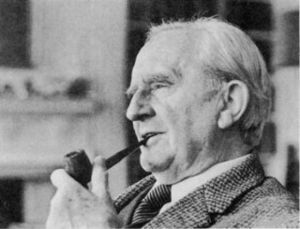 Tolkien became a professor of Anglo-Saxon and English literature at the University of Oxford in 1925 and remained in the post until his retirement in 1959. After his death, the masses of his literary work he left behind were left in the care of his son Christopher Tolkien, who continues to organize and publish his father's writings. He and several other writers (among them C. S. Lewis) were members of a literary club called the Inklings. Tolkien and Lewis were very close friends, and Tolkien had a major role in Lewis's eventual conversion from Atheism to Christianity, although he was somewhat disappointed when Lewis decided to be an Anglican instead of a Catholic. ↑ The Hobbit, first published by George Allen & Unwin Ltd. of London, on 21 September 1937. ↑ In an interview to Dennis Gerrolt, broadcast in January 1971 on the BBC Radio 4 programme Now Read On ..., Tolkien was asked if he was a theist, to which he replied I'm a Roman Catholic. Devout Roman Catholic. ↑ Heroes of the Faith, C.S.Lewis by Sam Wellman, Barbour Publishing, Inc., 1997. This page was last modified on 9 August 2018, at 12:23.